I do looove a quick dinner. 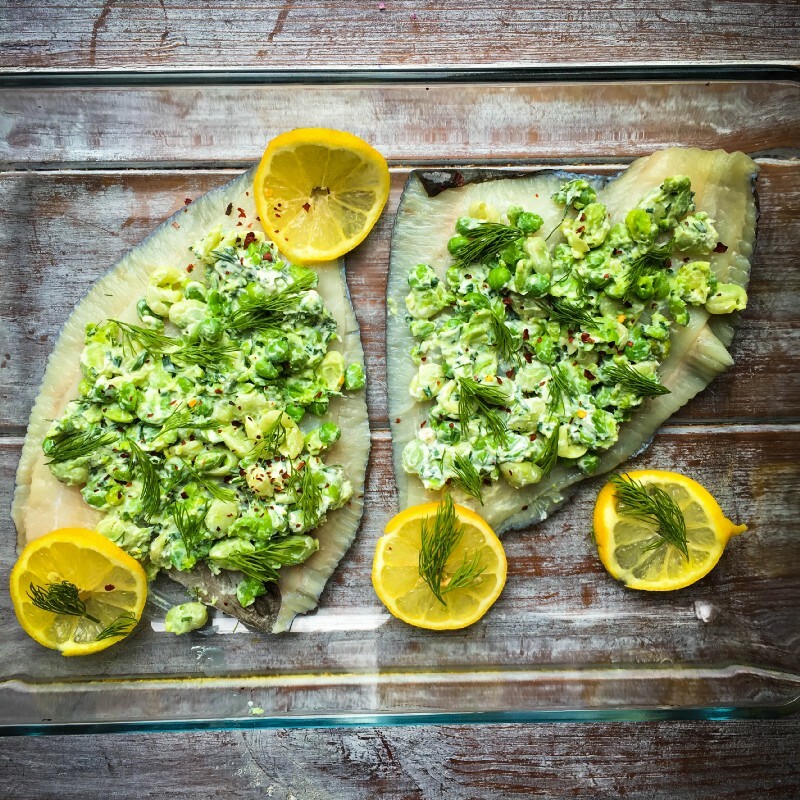 This fresh summery meal is smashed lemon-y dill-y chive-y and ricotta-y broad beans and peas on top of line-caught plaice fillets (any white fillets work well here though). Oily fish definitely holds the crown in terms of being the most nutrient dense fish, but white fish should certainly not be overlooked as a good-quality low-fat low-calorie protein source. These provide 235 calories, 30g of protein, 4g of fibre and 20% and 29% of my Vitamin A and C requirements respectively. It takes less than 10 minutes to prepare, and then 12–15 minutes for the fish to bake in the oven. · Steam the broad beans and peas until tender (approximately 5 minutes). · Put them in a bowl and mash to desired consistency — I like them quite chunky. · Add all of the herbs, salt, pepper, ricotta and the juice and rind of one of the lemons. Mix well. · Put the fish fillets in a greased oven proof tray (or on parchment paper to stop them sticking) and smear the veggie mixture on top. · Slice the remaining lemon and put them on top (with the chilli flakes should you choose to use them). · Bake for 12–15 minutes or until fully cooked through. Serving suggestion: Place the fish on a bed of lemon herbed quinoa.